nanjIyar highlights that madhurakavi AzhwAr enjoys bhagavAn since he is dear to nammAzhwAr. madhurakavi AzhwAr (who is fully surrendered to nammAzhwAr) pursues emperumAn (in this pAsuram) since emperumAn is dear to nammAzhwAr. emperumAn when pursued independently like sUrpaNakA is against the nature of jIvAthmA. But the same emperumAn can be pursued when he himself makes him available due to one AchArya nishtai like ANdAL said in nAchchiyAr thirumozhi 13.10 “thangaL thEvarai valla parisu varuvipparEl” (If periyAzhwAr‘s emperumAn comes to me, I will pursue him). A village chief named kAngEyan who was the head of guNamalaippAdi (a village) was helped by piLLai AththAn. When kAngEyan wanted to return the favours, piLLai AththAn said “You have already helped our AchArya who often remembers your help”. From this we can understand that, since emperumAn was dear to nammAzhwAr, he himself revealed his divine form to madhurakavi AzhwAr who is a dear sishya of nammAzhwAr without any individual efforts of madhurakavi AzhwAr. thripurA dhEviyAr says that if emperumAnAr identifies rudhran as the supreme god, she would easily accept that and follow him. That was her total dedication towards her AchArya srI rAmAnuja. periyavAchchAn piLLai highlights (in addition to what is highlighted by nampiLLai) that when emperumAnAr had gone to thirunArAyaNapuram, kUraththAzhwAn visited srIrangam temple. At that time, the gate-keepers highlighted the order of the king that forbids anyone who is related to emperumAnAr from entering the temple. But one gate-keeper said kUraththAzhwAn is filled with Athma-guNams (true auspicious qualities). AzhwAn at once said “If I enter the temple citing good qualities and giving up srI rAmAnuja‘s relationship, these qualities are of no use” and returned without entering the temple. madhurakavi AzhwAr said “dhEvu maRRaRiyEn” in the previous pAsuram. bhagavAn himself reveals his divine form to such madhurakavi AzhwAr here. Because it is dear to bhagavAn one engages in glorifying ones AchArya. And because it is dear to AchArya, one engages in glorifying bhagavAn. As bhagavAn himself says in gIthA 7.17 “priyO hi gyAnina: athyarththam aham sa cha ma priya:” (Those devotees are so dear to me and I am so dear to them as well). If one likes a person, he should also like those who are liked by that person. bhagavAn himself reveals his divine form to madhurakavi AzhwAr due to madhurakavi AzhwAr‘s unflinching attachment towards nammAzhwAr. Being pleased with that, madhurakavi AzhwAr realizes this divine vision is not due to his knowledge about total dependence towards bhagavAn, but due to being a servitor of nammAzhwAr only, not due to surrender towards bhagavAn – but only due to being totally surrendered to nammAzhwAr only. This is a fine example of bhagavAn himself acknowledging those who are totally surrendered to their AchArya. (Even if) I slipped from my AchArya nishtai, I (will) see the blackish beautiful divine form of srIman nArAyaNan who is the master of nithyasUris (eternally free souls in paramapadham). Please see the benediction I received by being true servitor for only nammAzhwAr who is born in AzhwArthirunagari that is great and magnanimous. In bhagavath vishayam, chAndhOgya upanishadh declares “na cha punar AvarththathE” (there is no returning after reaching paramapadham). But that is the first stage in ultimate goal, and final stage is to be totally surrendered to bhAgavathas/AchArya. If ever one slips from the final stage (of AchArya kainkaryam), they will only fall to the first stage (bhagavath kainkaryam). bhagavAn‘s divine form is so beautiful that sUrpaNakA who was punished by lakshmaNa started glorifying srI rAma and lakshmaNa’s divine forms when she went to complain about her plight to kara in srI rAmAyaNam (AraNya 19.14) “tharuNau rUpasampannau” (they are very youthful, very beautiful). periya vaN kurukUr – the great glorious AzhwArthirunagari. Since AzhwArthirunagari gave us nammAzhwAr who was divinely blessed by bhagavAn, it is greatly glorified. The town is filled with many greatly knowledgable persons. nammAzhwAr himself says in thiruvAimozhi 8.1.11 “periya vaNkurukUr vaN satakOpan“. When he slips from his AchArya nishtai, he starts singing about bhagavAn. Just like a yOga brashta (sage who deviated from their austerity and fell down – like viswAmithra) will start speaking about the beauty of Urvasi, etc. (damsels of svarga lOka), madhurakavi AzhwAr speaks about the beauty of bhagavAn‘s divine form. kUraththAzhwAn incident in srIrangam (that was seen in the introduction section) is explained here. madhurakavi AzhwAr says “adiyEn” (dhAsan – servitor) being humbled by nammAzhwAr‘s humility. Since bhagavAn is dear to nammAzhwAr, madhurakavi AzhwAr says that bhagavAn‘s vision “nanmaiyE” (very good only) even though he himself is personally more attached to serving nammAzhwAr only. For thirithanthAgilum (giving up) – the route is explained. That is, thiruvAimozhi pAsurams (2nd pAsuram), the music of the same (2nd pAsuram) and finally AzhwAr himself (1st pAsuram) – giving up all these, madhurakavi AzhwAr pursued emperumAn. dhEvapirAn – leader of nithyasUris. Even when madhurakavi AzhwAr slips from his AchArya nishtai, he only falls to see paramapadhanAthan only and assumes the state of nithyasUris. nammAzhwAr appeared in kaliyugam during the dark ages when bhagavAn‘s generosity is not visible. It is in this AzhwArthirunagari town, the most generous nammAzhwAr appeared. By saying “kurukUr nagar”, madhurakavi AzhwAr distinguishes AzhwArthirunagari from srIvaikuNtam (paramapadham). Whatever emotions nammAzhwAr had towards paramapadham while saying “ayarvaRum amarargaL adhipathi” (thiruvAimozhi 1.1.1 – unquestionable leader of nithyasUris), madhurakavi AzhwAr feels the same emotions while saying thirunagari and nammAzhwAr. ALuriyanAy – By being a suitable servant – without any personal likes and dislikes and serving solely for the desires of nammAzhwAr and giving up attachments to those aspects which are not liked by nammAzhwAr. 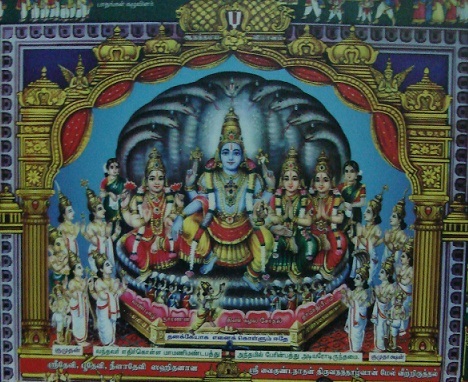 thirithanthAgilum – nAyanAr gives a different and beautiful view point – Even while roaming around without any direct attachment towards emperumAn (since he already said in previous pAsuram that he is roaming around singing nammAzhwAr‘s pAsurams), emperumAn mercifully showed his divine form to madhurakavi AzhwAr. While all AzhwArs had great attachment towards bhagavAn, madhurakavi AzhwAr had great attachment towards nammAzhwAr only. As said in jithanthE sthOthram 1.5 “bhakthAnAm thvam prakAsasE” (you manifest your divine form, ornaments, etc., to your devotees) – here madhurakavi AzhwAr is such nice devotee – so emperumAn manifested his divine form to him. kariya (blackish form) – While nithyasUris enjoyed his divine form it was pale. Even when nammAzhwAr enjoyed his divine form it only became golden color as said in 2.5.1 “ennAvi sEr ammAnukku sempon thiruvudambu” (My lord’s form is in beautiful golden color). But only when madhurakavi AzhwAr had the vision of his form, emperumAn‘s form became blackish. Blackish color indicates bhagavAn‘s audhAryam (most magnanimous/generous nature) like a cloud ready to shower the rain for the benefit of everyone. For thiruvuru – nAyanAra again shows a different and beautiful aspect – the form that is accompanied by “thiru” (srI mahAlakshmi). I saw emperumAn since he was blackish instead of nammAzhwAr’s golden form. I saw because there was thuLasi smell instead of vakuLa flower smell. In any case, since the form looked different than nammAzhwAr‘s, I saw emperumAn‘s form with a little bit of fear in my mind. periya vaN kurukUr – Great glorious AzhwArthirunagari – When compared to AzhwArthirunagari, paramapadham is very small (in glories). As mentioned by nammAzhwAr in periya thiruvanthAdhi 75 “puviyum iruvisumbum ninnagaththa ni en seviyin vazhi pugunthu ennuLLAy” (You have the entire creation within yourself, but you have entered through my ears (through sAsthram) and is inside me now” – nammAzhwAr holds vibhUthimAn (owner of everything) and the vibhuthi (aiswaryam – wealth) within himself. Such nammAzhwAr is inside AzhwArthirunagari – so it is a great town. Even nammAzhwAr was greatly longing for the vision of emperumAn‘s divine form. But since I am a servitor of nammAzhwAr, bhagavAn himself manifests his divine form to them. nAnmugan thiruvanthAdhi 15 “EththiyiruppArai vellumE maRRavaraich chAththiyiruppAr thavam” (the greatness of devotees of devotees of bhagavAn is much higher than greatness of devotees of bhagavAn) – madhurakavi AzhwAr realizes this in his own personal experience. This entry was posted in kaNNinuN chiRuth thAmbu, mudhalAyiram on January 31, 2015 by Sarathy Thothathri.